My recently eBay’d copy of The Legend of Zelda for the NES arrived in the post today, woo hoo! What’s the first thing I did? Why I took it apart and cleaned the contacts of course. With clean contacts all my NES games work beautifully on a NES that has lived in a garage for the better part of this millennium. Even without replacing the 72-pin connector. 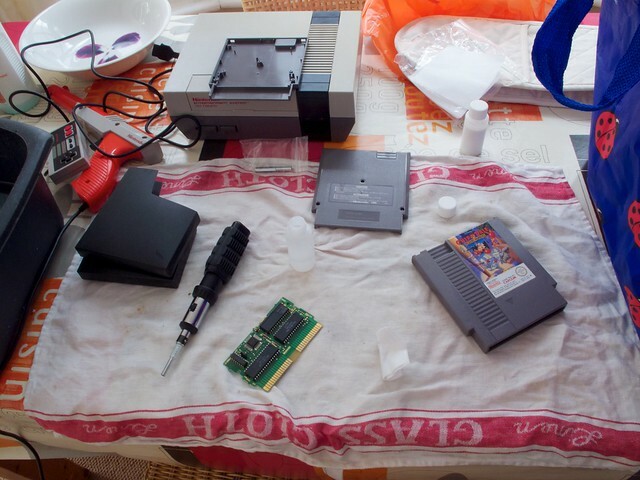 I’m using a cleaning kit I picked up from Nintendo Repair Shop, it’s worth it just for the proper screw driver bit to take the cartridges apart. So much for just focussing on collecting Gameboy stuff because it doesn’t take up much space. Since Deciding that I’ve managed to acquire more of the Nintendo family tree as it were. First off in May, the sound on my PAL Super Nintendo was on its last legs. I happened upon an auction for a SNES in super good condition that was just the console; no games, cables, etc. Fine by me as I already had that. £3.something later I was the proud owner of a second European SNES. Not only does the sound work on my new one, but it’s not yellowed either. Score! In June I had a hankering to play The Legend of Zelda: Ocarina of Time. Which is a bit odd for me because I never really got into the Nintendo 64 that much. Still, that was enough to get me looking through eBay. Another big score there. 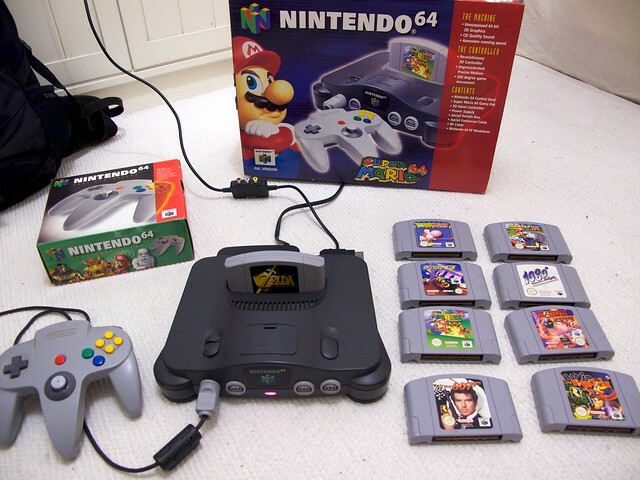 For £29 (I think it was, if not it was close) I got a mint N64 in the original box, a second controller in its box, a memory card / rumble pack and nine games (some with their instruction booklet). Best of all, Ocarina of Time was one of the games. Mario 64 was in the mix as well which gave me a good opportunity to give that game another try. I’m warming up to it. There was one more game that I had to get and that was Starfox 64. The European version is called Lylat Wars for some bizarre reason. I should look that up. And do a barrel roll. 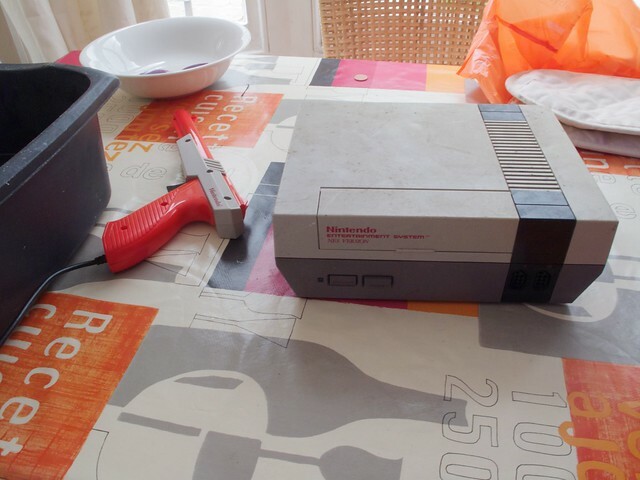 Ages ago my mate Charlie said that I could have a Nintendo NES that he found in his parent’s garage. I went and visited him yesterday and oh man, it was a pretty decent haul of NES stuff that I made away with. Sure it was all a bit mucky from being in storage but nothing a couple of hours cleaning this morning couldn’t fix. 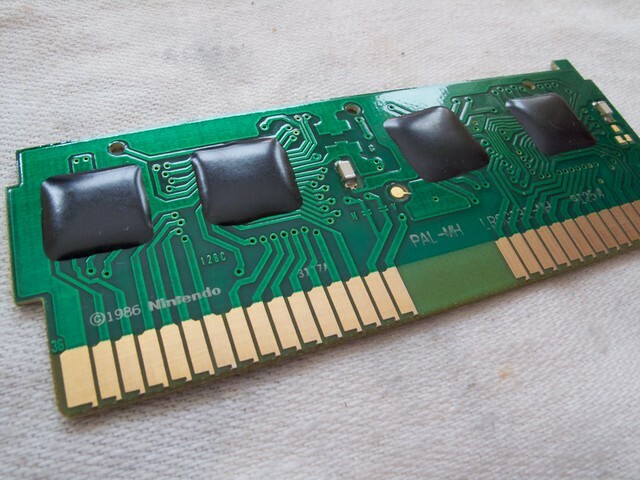 I even took apart all of the cartridges and cleaned the connector pins. No corner cutting here. And here’s the whole lot, all cleaned up and ready to go. 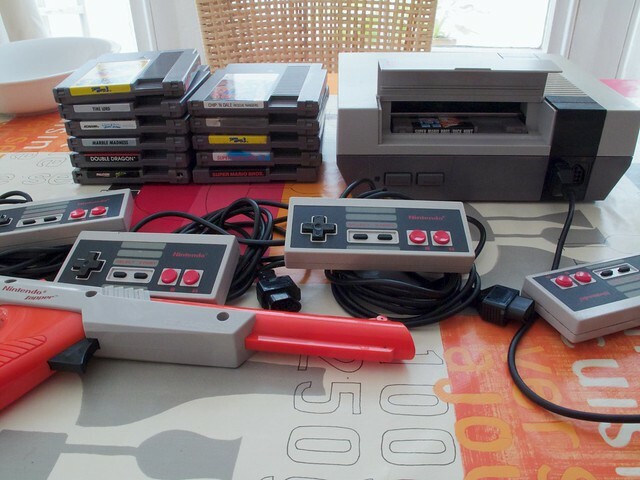 An ‘NES Version’ console, four controllers, an orange Zapper and twelve games. A nice bonus is that the Super Mario. 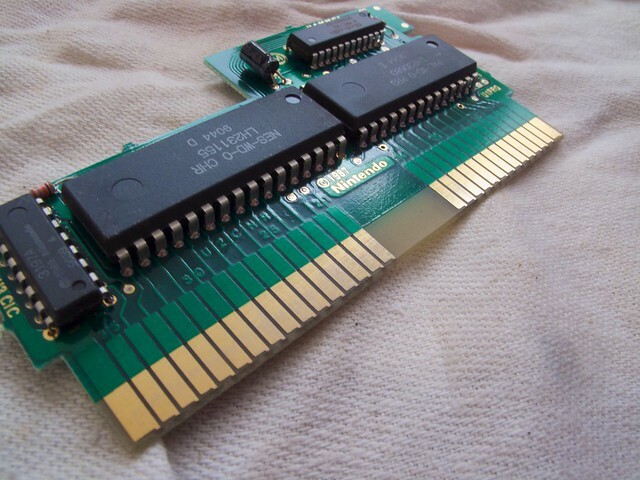 Bros cartridge is one of the early release ones with a different cartridge design. Notice how the top doesn’t have the same notches as all the other carts. There’s also five screws on the back instead of three. NEAT. Now if you’ll excuse me, I’ve had world 3-3 of Mario 3 on pause for a while and should get back to it. As recently mentioned, I’ve been keen on collecting Gameboy games as of late. They’re tiny and don’t seem to be quite as popular (ie: pricey) as some other older consoles and games. 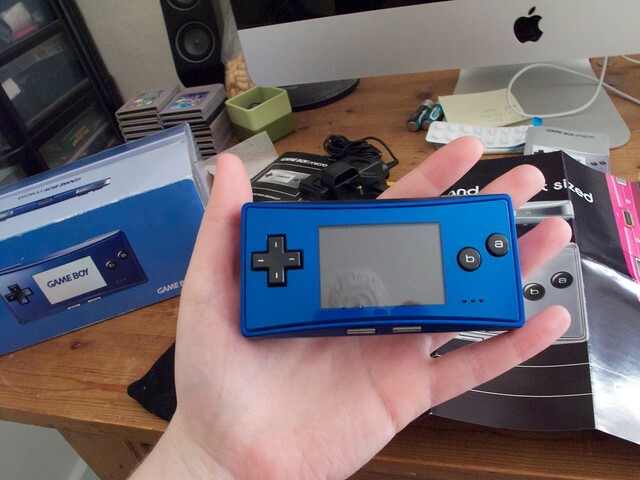 For whatever reason the idea of getting a Gameboy Micro popped into my head last week. I can’t even recall why. When they first came out six years ago I was a bit intrigued but dismissed them as being too small. It didn’t help that in North America they were packaged with three kind of ugly faceplates. I started looking on eBay for them. Ah! In the UK not only was the packaging different, but the colour schemes were as well. 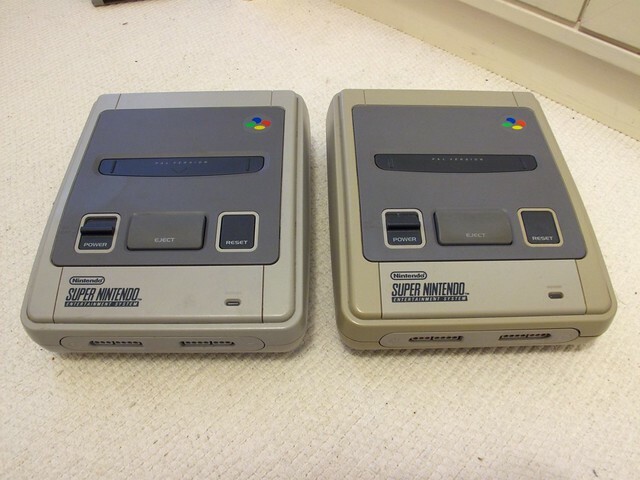 You had your choice of four metallic colours rather than having to go with whichever faceplate you found the most agreeable (or buying another one). There sure were a lot of pink ones on eBay. I wasn’t having that though. The blue, silver and green were all really nice looking so I loaded up my watch list. After a few days of them going for what I thought was too much, I realised that I’m probably not going to get one cheaper than the standard going rate of £30. Not if I wanted one that wasn’t banged up and/or missing parts. I ended up getting a blue one, with the original packaging (velvety carry pouch ahoy!) for just under the going rate. Smashing! It arrived yesterday and I must say it was love at first sight. The build quality is really quite nice. I much prefer the buttons and D-pad on the Micro over the Gameboy Advance SP. It’s also really comfortable to hold for long periods of time… confirmed by a couple of hours of Castlevania Aria of Sorrow last night. And the screen… well yes it is tiny but that doesn’t make it hard to play at all. If anything it makes the GBA games look better. Both the SP and micro have 240 x 160 px resolution but on the Micro those pixels are pushed closer together. The speaker quality and volume isn’t that impressive, but I’m really not surprised. What is nice though is the built in headphone jack. No more having to use a goofy adapter with my SP to use headphones. (yes yes, I could use my DS Lite, but it’s just not the same as usually original hardware remember! ).